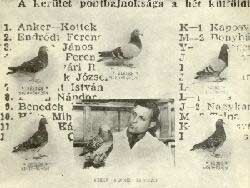 When Georges Veys passed away in 1973 most of his pigeons came over to my loft. The breeding tradition of "cross-breeding" the lines of "De Oude Rosten" with the lines of "De Oude Klaren of '46" brought me too great successes. In those years I visited Professor Alfons Anker of Kaposvar, Hungary, the great geneticist, in order to discuss the best way to breed back the bloodline of "De Oude Klaren of '46" by way of severe inbreeding. To realize that a special inbreeding program was designed (described here on this site by in "The Art of Breeding). www.winningmagazine.nl. On a certain moment there were 15 grandchildren of "De Oude Klaren of '46" in my breeding loft. They were direct descendants of: "De Schonen", "De Groten", "De Jonge Klaren", "De Oude Grijsoge", "Het Prinseske", "De Klaren II" plus direct children from "De Kapoen", "De Rik", "De Ballon", "Het Stuur" etc. Left to right: Jules Rijckaert, Jef Sijmons, Prof. Anker en Raoul Verstraete. For several years at a stretch all attention was put on the inbreeding of those birds and I did not took part in any races at all. When my breeding loft contained enough valuable inbred material I searched carefully for crossbred material especially of the Janssen strain. The fantastic results just out of this single crossbred combination made my name go round the world. I'll describe with what birds this was done into detail later on.